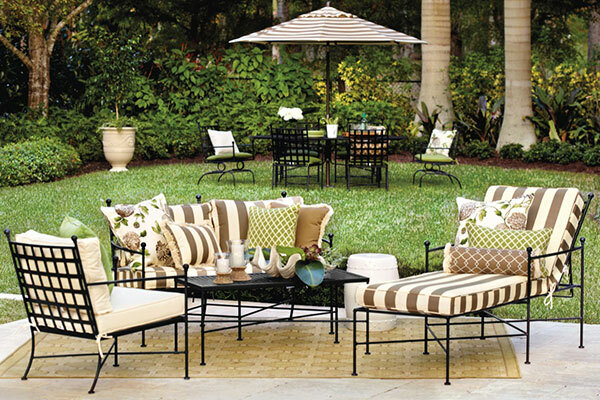 Is your Outdoor Living Space Ready for Summer? Now that we are seeing signs of Spring, it’s a good time to start reviewing the state of your outdoor space and make plans to create or enhance the living space you desire. Whether you design an entirely new space, complete with outdoor kitchen and fireplace, replace worn out items, or just add a few new pieces, planned thoughtful design ensures a happy outcome. It is always beneficial to have an overall plan for your outdoor space. If you are planning a new deck or patio, do not leave it up to your landscaper to determine how much space you need for your outdoor seating/ dining areas or where to locate it! It is easy to underestimate how much space you need. Planning an outdoor space is like designing a room. Think of your outdoor living space as an extension of the inside. Here are some questions to consider as you plan your space. What is the intended use of each area you are considering? What types of activities will take place there? How large of a crowd do you normally entertain? What are the traffic patterns in and out of the house? How close do you want to be to the kitchen in the house? Do you want to be in the sun or shade? Is protection from mosquitoes a priority, especially if you like to eat out in the evening? Outdoor seating such as lounge chairs are often made to a larger scale than indoor chairs. If you have a small patio area then make sure that they do not look disproportionate to your outdoor living area. Make sure to check the dimensions. A floor plan is a good idea which I can draw up for you. Advances in the textile world have improved the choices we now have when choosing fabrics for our furniture. You often cannot tell the difference between indoor and outdoor materials. The secret is in the dyeing process. You get the benefits of no fading, stain protection and easy cleaning (even with bleach) without compromising on style or color! Consider reupholstering your outdoor furniture with some of the new and boldly patterned designs which are on trend right now. Traditional white wicker sofa updated with new fabric and colorful pillows. Tdf interiors. There are even outdoor leathers that look and feel amazing. From tequila and tanning oil to red wine and sunscreen, this leather will wipe right up with water. Both colorfast and water/stain repellent Holly Hunt’s Chiberia is perfect for both indoor and outdoor. Avoid having everything matching. This is as boring for your outdoor space as it is for your indoors. You do not have to stay with the same material, for example, wood, for your outdoor furniture. 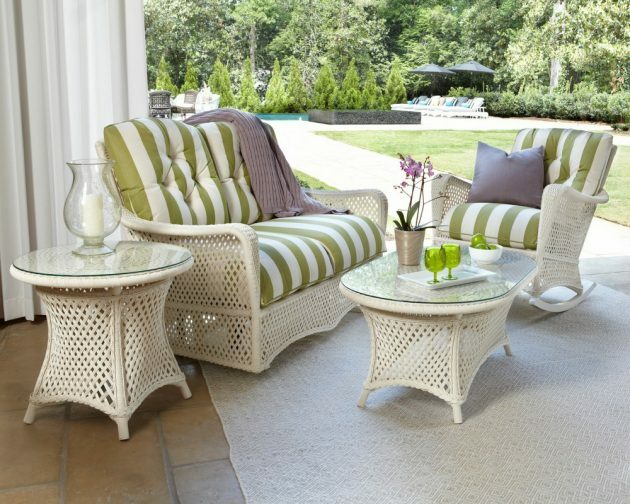 Mix it up for a more updated look with a combination of wood and all weather wicker. Equally, you can combine a more traditional looking dining table with more modern seating.